SCVHistory.com HS8003 | Heritage Junction | Blueprint: SPRR Saugus Depot Relocation Plot Plan, 1980. 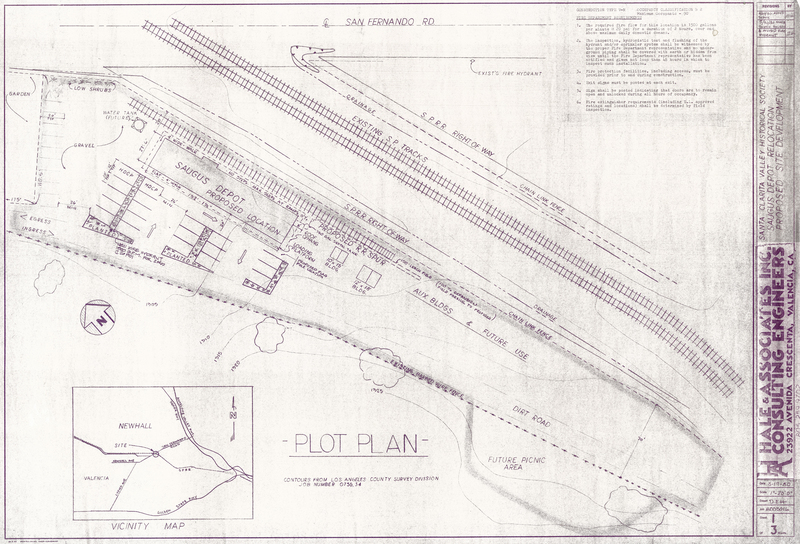 Plot plan for the 1980 relocation of the Southern Pacific Railroad's Saugus Depot to Heritage Junction Historic Park, located on the "Frew property" inside William S. Hart Regional Park in Newhall. The abandoned 1887 depot was moved overnight June 24-25, 1980, from its original location at the southeast corner of present-day Drayton Street and Railroad Avenue (previously called San Fernando Road). Blueprint by Hale & Associates Inc. Consulting Engineers (Don Hale) of Newhall, March 19, 1980. The Los Angeles County Board of Supervisors officially approved the move to the park property June 3, 1980, when it ratified an operating agreement with the Santa Clarita Valley Historical Society. HS8003: PDFs and 9600 dpi jpegs from original blueprint, Santa Clarita Valley Historical Society files.